I’ve had a few days to wander through New England prior to heading West. It’s been delightful to reacquaint myself with the landscape and architecture. I’d forgotten how simple it is. The repetition of strong rectangular shapes lends itself to interesting compositions. Despite a bit of rain, I took a lot of photos and had a few opportunities to draw. 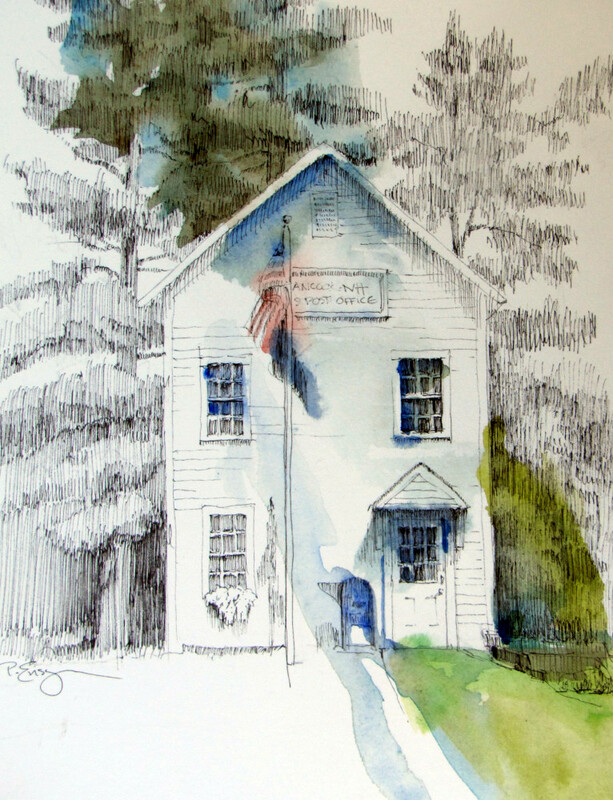 One building that epitomizes these strong Yankee proportions is the post office in Hancock, New Hampshire. It’s a basic two story white clapboard building – quite different from the post offices in the West. 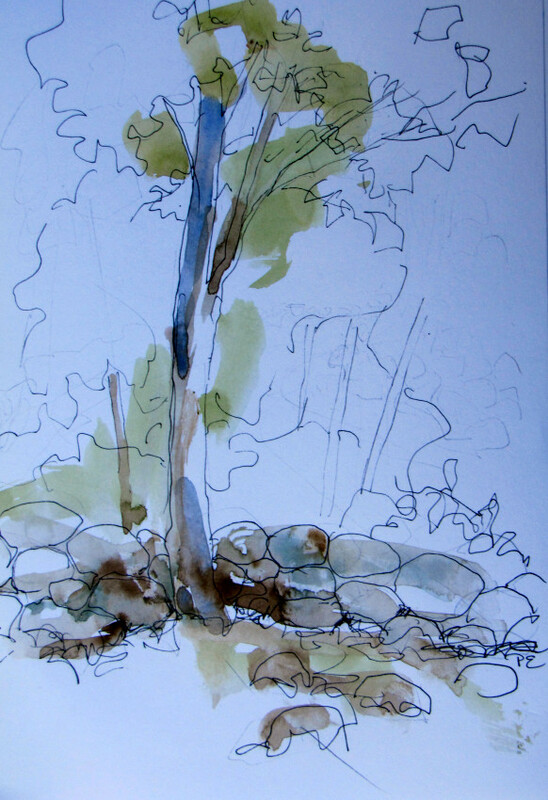 I decided to draw it straight on to emphasize its stark simplicity against the backdrop of dark pines. Isn’t it interesting to learn what people are inspired to draw? There are any number of interesting buildings in Hancock, including the very lovely church next door to the Post Office. But it was this unassuming rectangle that tugged at me. It’s really important to draw what interests us – be it a twig or a grand view. What we choose for our subject is part of our art. I enjoyed drawing on the town green across from the post office, listening to the chatter as locals came and went to get their mail. Sitting down to sketch in any location is such a great way to experience the ambiance of a place. Drive almost any country road in New England and you’re sure to see rock walls lining the way. They are remnants from a bygone era, worn down and so weathered they appear to be part of the earth. Most are covered with thick moss and already toppling into loose piles. I wonder when they were built and how long they will last. From the car I snapped a few photos. I couldn’t find a good place to park and sit to get the views I was looking for. This quick sketch is from memory. I’m quite sure more detailed drawings will happen when I return home. My, what a nice little book this will make. You did think about this right? That’s an idea – I hadn’t thought about it. Thanks, Blanche!